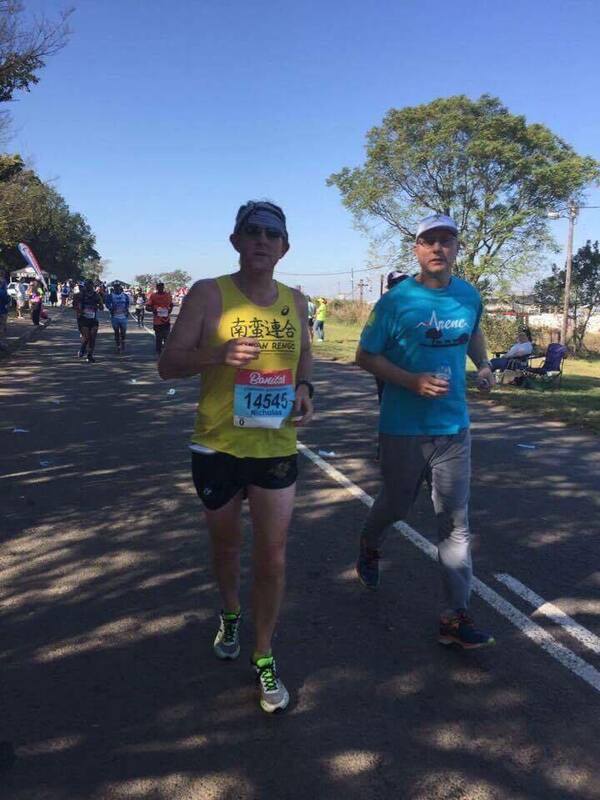 Back in October 2016, Nick C. a veteran Marathoner decided to train for Comrades Ultramarathon. It was going to be his second attempt to finish an ultra distance. Below is his story during the 31 weeks of training leading to the event. A truly inspiring journey in which Nick gave his best, sweat, tears and heart. Make sure to watch the video at the end !! Amongst the bustle of the runners around me, the deafening cheers from the on-lookers, and the mouth-watering smells that wafted from hundreds of street-side BBQs, I contemplated the puzzle that I had started to put together 31 weeks ago, which had me at this very junction now. Today wasn’t a journey – journeys for me imply that one is typically in the hands of others, so as to get to a certain destination. Neither was today the final execution of a plan; plans in their most basic form are carried out by way of a methodical process, ignoring such components as the generosity of friends and the kind-heartedness of strangers. A puzzle on the other hand, defines most accurately the process of bringing something to completion, often through one’s hard work, but more commonly through the collective support of others and, as Sergeant Linda bellowed earlier, always by putting one step in front of the other. The following narrative is my attempt at introducing all of the pieces of the puzzle that came together for me on Sunday June 4, 2017, allowing me to successfully complete a long-held dream; that of running the Comrades Marathon in South Africa. In October last year, I asked Harrisson Uk to coach me and manage my training regime for 8 months until race day. Harrisson, an extraordinarily gifted man possessing no end of talents, kindly accepted. This was not just some random running guy who would e-mail weekly training schedules; this was the ‘real deal’; a fully-fledged and fully-committed coach who would manage my training, my mental and physical wellbeing and all things necessary for me to make it from Durban to Pietermaritzburg. Harrisson coaches many fine athletes in Tokyo, all extremely proficient runners, and all having achieved very high levels of success. And then, as one day rolled into the next, he was my coach too. From day one, Harrisson took a genuine interest in me, my training, my work schedules; he afforded me the same time and level of intense support that he provided to all of his elite runners. No centimetre of any training run uploaded on my Strava missed his keen eye; instructions on cadence counts, scrutiny about course selection, demands for updates on my weekly weigh-in, questions on how many hours of sleep I was getting a night, how much beer was I drinking, what milk I was putting in my latte coffees, how was I feeling on recovery days. But, questions are questions and data is data; Harrisson is more than that; so much more. Out of data he collected, he looked for trends and constantly helped to provide solutions for all sorts of issues that arose during the course of my 31 weeks of training. Harrisson not only put the very first pieces of the puzzle in place, but with pin-point accuracy he added to it each and every day. By the early part of 2017, I was clocking up nearly 300 km per month. I was making small improvements in strength, and enjoying some success with my racing. In October, Alan Canon invited me to run a charity 10km race around the Imperial Palace, and in the pouring autumnal rain I surprised myself with a 44:40 PB; 2 minutes 10 seconds quicker than my previous fastest. Later in November, on a fresh Sunday morning in Saitama, I took 5 minutes off my half-marathon best time, bringing it down to 1:44:15. I was seeing some results, and at the same time gaining confidence in the way I was approaching my races. But as these small successes helped to add some parts to the puzzle, there was a difficult area that remained badly unresolved; my weight. Since quitting smoking 12 years ago, I had gained nearly 25kg in weight. When I committed to running the Comrades in September last year, I was 105kg, +-5kg either way. Years of business trips, hotel food, airport lounges, fine dining, beer / wine drinking and active participation in various social circles in Tokyo had brought me into a spiral of unhealthy eating, heavy drinking and unsustainable physical conditioning. That’s okay, I thought; being overweight was much healthier than being a smoker, right…? Very true; and besides, even if I was the fattest guy in the shower room on Wednesday evenings, at least I was fit enough to enjoy a very active and social running calendar of numerous marathons, 5-10km races, and weekly interval workouts. These of course were all excuses which I desperately tried to hide behind. But no matter how hard I tried to justify it, the elephant was always in the room and it wasn’t going anywhere. I alone could not solve this one, and Harrisson knew that. Harrisson worked closely with me to untangle the quagmire of my eating / drinking habits. After various ups and downs and attempts along the way, he was finally able to put the correct pieces together; 5 to be exact. (1) nothing white, (2) absolutely no calorific drinks, (3) green salads for lunch every day, (4) absolutely no fruit, and (5) go crazy on a Sunday! For the next 5 months, these five rules dominated my eating habits. Giving up carbs and fruit at breakfast was especially difficult; no more thick peanut butter on butter-drenched toast; no more fresh fruit and muesli, and no more Full English Breakfasts after a long Sunday run. It took me a great deal of time to get comfortable with 3 boiled eggs, and a dish of wobbling cold tofu or half an avocado in the morning. Lunch too was going to be a challenge; how on earth does one eat salad in the middle of day? Salad is great, but only when accompanied with a creamy pasta or toasted cheese bagels, right?!. Seriously, all on it’s own….?? That was going to be tough..!! And of course, no more visits to the family Tonkatsu restaurant of 50 years near my work. No more interaction with the terse Chinese waitresses who served great fried rice dishes on the corner. Instead, I would enjoy a five-minute walk to the salad shelves at the nearby 7-11, and stock up on salads, eggs, healthy chicken and nuts. Step by step – piece by piece – I was breaking down my old eating habits, and my discovery of new foods immediately started to have impact on my weight loss. Going forward, I must remain diligent about keeping these pieces of the puzzle firmly in place, and learning to maintain a healthy and balanced diet…running or no running. Of all the help, advice, mentoring and support I received from Harrisson, I am most grateful to him for his commitment and dedication in helping me get my weight down, and putting me back in control of my diet and body. 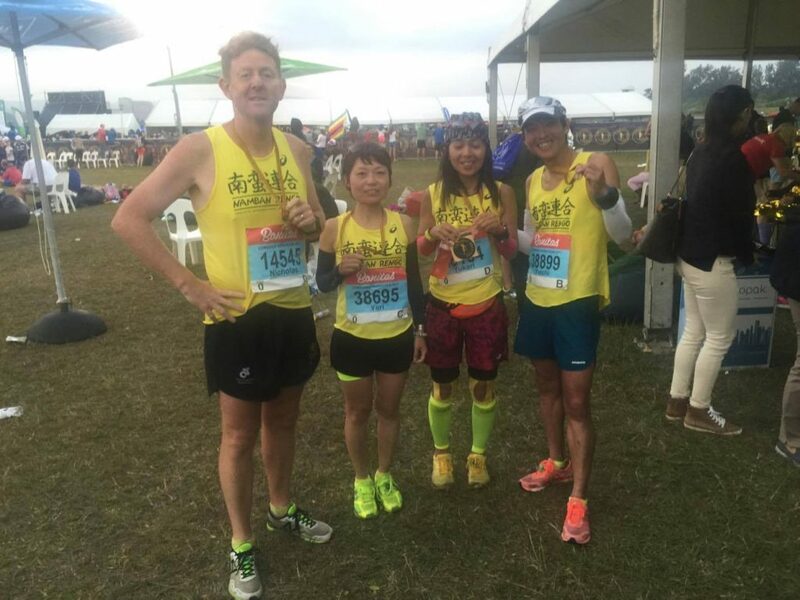 The next pieces of the Comrades puzzle fell into place through pure luck and good fortune; that was the other Namban runners who would choose to sign up and travel with me to South Africa. And boy-oh-boy…..didn’t I totally luck out here…! Yuichi Kanamori and I have built a strong friendship over the last 3-4 years. We share the same age, love for running and appreciation of rugby. But that is about where the similarities end. Yuichi is probably 35 kg lighter than me, and has an extremely elegant running style; straight back, soft gate, light cadence, low arm positioning; he almost appears to be denying the forces of gravity upon his body when he runs. 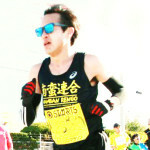 In any photo of Yuichi, one will always see his incredible smile – impossible to replicate; a smile that reflects his positive outlook on life and running. I was thrilled beyond words when Yuichi decided to join me to South Africa, and race the Comrades with me in Namban colours. Yuri Kambara heard of our plans for South Africa at the Namban BBQ in October last year, and made a decision on-the-spot to join us. Indeed that is one characteristic, among many, which I admire about her; she is decisive, straightforward, generous and focused. A sub-three-hour marathoner, winner of the New Caledonia Women’s Marathon, 3-time consecutive winner of Mt. Fuji mountain race, to name a few. She is in my opinion one of Namban Rengo’s most celebrated runners. I remember thinking how excited I was that Yuri too would make the trip to South Africa with us, and wear the Namban colours alongside Yuichi and I on Comrades Race Day. Yukari Oimatsu had wanted to race Comrades for some time, and upon reflection it is indeed a no-brainer that an ultra-runner of her calibre and ability would sign up. A finisher of 13 x 100km ultra marathons, countless full marathons and long-distance events. An incredible runner with a Herculean-like spirit, Yukari impresses upon everyone her will to compete right up to the very end. As we registered at the Comrades Expo prior to race day, I got the feeling that the Comrades Marathon needed Yukari more than Yukari needed the Comrades Marathon. Lining up alongside Yukari in Block D at 04:45 that Sunday morning was one of the highlights of my Comrades experience. As I write this narrative on my return flight to Tokyo, I can only thank them all – Yukari, Yuichi and Yuri – for being an unforgettable group of friends and club members with whom I travelled and shared so many wonderful experiences. Bucket loads of fun. Too much laughter. Never enough beer! There was one piece to the puzzle that we desperately needed help with; the ‘getting there’ part. South Africa is a long way from Japan. It is an unknown country to all of us. It has a reputation as a very dangerous travel destination, especially to tourists. It was our first time to travel there, and indeed we had no clue how to arrange our trip. Who should come to our rescue in the finest form possible; my son Jacob. 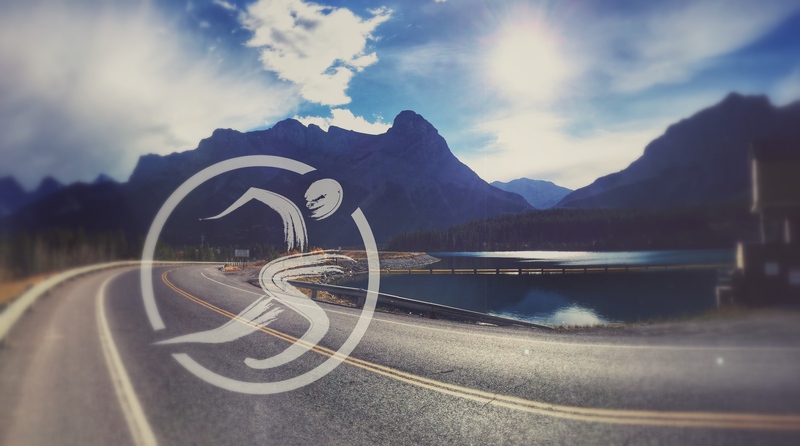 With his amazing research skills, Jacob dealt quickly with all the travel, accommodation and logistics for our trip, for all four of us and secured a phenomenal package at almost unthinkable prices. Thanks to him, we were able to fly business class on one of the best airlines in the industry (Qatar Airways). We were able to stay at one of the most talked-about resorts in South Africa (Fairmont Zimbali Lodge). We were able to have such a memorable trip as a result of his brilliantly thought-out arrangements. We are all so very grateful and thankful to him for this. In addition to Jake’s awesome support, we were also extremely lucky to receive the help and support from our old Namban friend, John Tadman, who now lives in South Africa. John flew down from Johannesburg to be with us, hired a vehicle, stayed at our lodge, supported us all at 34km and 65km points on race day, and took such wonderful care of us including arranging a visit to the incredible Hluhluwe–Imfolozi Reserve Park. John’s contribution to the puzzle was incredible and every piece he laid was done with the hands of kindness and with great affection for the Namban Rengo club and club runners. Much thanks to John, and best wishes in his endeavours to complete the Comrades next year. The very final piece to the puzzle – the actual running from Durban to Pietermaritzburg – was solely in my hands. I owned this piece of the puzzle and I needed to finish it under my own steam, and before the 12-hour cut- off. The good news is that I made it, and in a surprisingly decent time. The details of how I ran, when I walked, what I ate, when I ate, how many times I urinated, etc., are not for pen to write nor for paper to record. What is more important is the relaying of the special moments that can only happen on a Comrades Marathon; an incredible exchange of friendship with another runner, an act of random kindness from a volunteer, a hearty cheer from a complete stranger. Every Comrades finisher experiences at least one special moment that he / she will store in the treasure box of their hearts for a long time to come. I am about 3kms before ascending the dreaded Polly Shorts Hill, and I spot a runner. His race bib informs me of his name – Boysie – and the number of Comrades he has previously done – 39. Afterwards I would learn that Boysie is one of the most decorated Comrades runners, and has featured in TV and on print many times in South Africa; a national ambassador for Comrades. As I approach him from behind, I touch him on his left shoulder and congratulate him on his 40th Comrades; I tell him that he is an inspiration to me, and I remark on what a special Comrades it must be for him today. He looks at my race bib, noting that this was my first. He then looks up at me and smiles; ‘Thanks, but you know, yours is equally as special; this is your first Comrades and you will never forget it. Enjoy your Comrades, Nicholas. Enjoy your first Comrades.’ Such a humbling moment, and such an honour to have Boysie lay the last pieces to the puzzle. Amazing mate, you’re a new man and an inspiration !